GRPC offers field trip programming designed for persons with special needs, including those with autism, Down syndrome, ADD, ADHD, deafness, blindness, and mobility impairments. The Open Space Authority has worked with us to create this program, funded by a generous grant from the Yahoo Employee Foundation. River Explorers is a hands-on, outdoor program that takes participants down into the river to experience a riparian habitat. 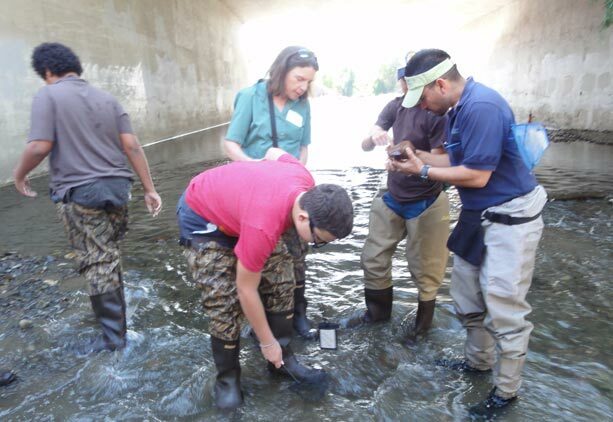 Students will learn about the wildlife community at the Guadalupe River and the biological adaptations of certain species. We also offer Flower Power, a program where special needs students can explore what the Heritage Rose Garden and Historic Orchard have to offer. Utilizing engaging, hands-on activities, students will learn about flowers, fruit and the life of pollinators. Students will also learn about the history of the fruit growing in the valley and have the opportunity to sample fresh or dried fruit in the Historic Orchard. It’s simple – visit our Field Trip Request Page and follow the instructions listed! Note: field trips must be scheduled 45 days in advance. For more information about our special needs programs please contact education@grpg.org or call 408-298-7657.